Pygmy Date Palm is a dwarf plant reaching several feet tall after several years. Give it some space, though. This slow-growing palm will spread to about 4 ft wide. Its long, arching fronds feature slender, delicate-looking leaflets. 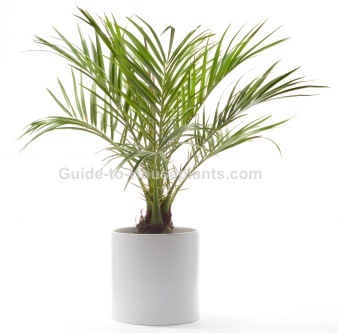 Unlike other date palms, this one has soft leaflets giving it a feathery, elegant look. There are sharp spines at the bases of the leaflets, so it's a good idea to wear garden gloves when trimming off old fronds. 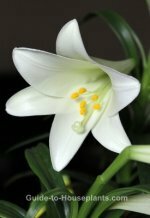 This plant doesn't require a lot of attention, but be careful not to overwater it. Poor drainage and soggy soil can cause root rot. Brown leaf tips? If the tips of the leaflets turn brown and crispy, the air is too dry. This Southeastern Asia native needs a humid environment. 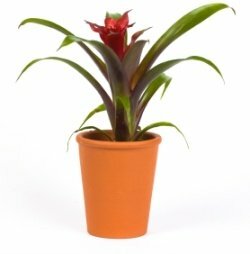 Mist the plant often or use a room humidifier to raise the humidity in the air around it. Wondering whether to repot? Repot a young plant in spring every couple years, to give it the space it needs to grow. When it gets older, just top dress by replacing the top couple inches of soil. Pygmy Date Palm has delicate roots and doesn't like to be disturbed. Use a heavy container to prevent it from toppling because this spreading palm gets top-heavy. Watch for pests. Scale insects are brown, oval bugs that tend to hide out on the undersides of the fronds, along the midrib. As scale feed on plants, they excrete honeydew -- a sticky substance that often attracts sooty mold. Isolate an affected plant and treat any infestation immediately. Buying tip: Another common name for this plant Dwarf Date Palm. This palm is usually sold by the species name. Look for Phoenix roebelenii to be sure you're getting this plant. Light: Bright indirect light. Strong morning light from an East-facing window will give your palm the light it needs. Give the plant a quarter turn every week to expose all sides to sunlight. Water: Keep soil moist spring through summer and barely moist in fall and winter. Humidity: Moderate to high. When the relative humidity drops below 50%, stand the pot on a humidity tray and mist the foliage with room-temperature water. Temperature: Average to warm 65-85°F/18-29°C year-round. It will tolerate a minimum of 55°F/13°C in winter. Soil: Use a potting mix that drains well. I recommend adding perlite or sand to a standard potting mix. Fertilizer: Feed once in spring and again in summer with a time-release fertilizer. Rose fertilizer works well because it provides the micronutrients this palm needs. A shortage of magnesium will cause yellow spots on the leaflets. Propagation: Cut off the suckers that grow at the base of the plant. Be sure to include the roots with it, and pot them in separate containers. Plants can be grown from seeds, but you'll wait years for the plant to grow into a tree.